A new teaching tool for young snappers has arrived – Bigshot, a build-your-own digital camera designed to get young people enthused about photography. 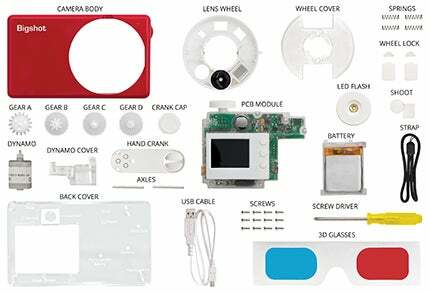 The camera kit is delivered in pieces which must be assembled in the correct order, with an online tutorial for guidance and explanation of the science. Once it’s put together, the user has a fully functioning 3MP compact camera on their hands. 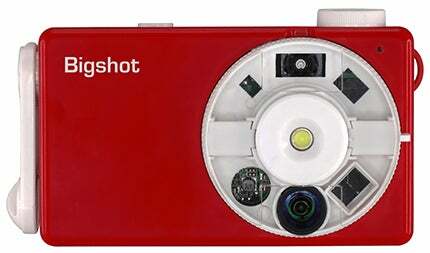 Bigshot comes with a few unique features that the manufacturers hope will make it appeal to children. One is what the makers refer to as a ‘Swiss army lens’, which provides several different lens types on a single rotating wheel, from regular to panoramic and even 3D ( the kit comes with a set of anaglyphic cardboard glasses). Another clever twist is the battery hand crank, which allows the user to manually provide a little extra juice when on the move. Bigshot was created by Professor Shree Nayar and the Computer Science department at Columbia University, with a little funding help from Google and the US Department of Defense.